Yet Another Mail Merge (YAMM) is a Gmail mail merge tool designed to help users send personalized emails, newsletters or forms to multiple recipients without needing to know how to write HTML. Work for Yet Another Mail Merge (YAMM)? "Quick, effcient and clean solution for mass mail merge"
I love the ability to set it up easily in conjunction with Gsuite and google sheets. Just enter the Fname, Email in a table and you are set as long as your drafts are ready. Its easy to use and reuse and the dashboard gives me a campaign wise view. this is great for sales outreaches on an independent level. This is worth the money. If you use Gsuite, this is a wonderful add on to being able to personalize mass emails. Note that this does NOT have easy templates like mailchimp, but instead lives on content you have created on your gmail inbox. "Easy yet effective email marketing tool"
The ease at which i can have multiple lists in the google sheet and send emails to chosen contacts by filtering out. the templates of the email that i wish to send out are easily altered and created in gmail drafts folder which help ease a lot of issues traditionally i used to face for email marketing. nothing much, just that sometimes i am not sure if the read receipts and the email clicked are happening in real. Absolutely easy tool if you are looking for email marketing and bulk emailing!! If you are someone who has used outlook and have done mail merge from Word, you will love how simple this tool is !! one of the key things to marketing and sales is to be able to be in touch with your clients and prospects and emails form a major chunk of how businesses are spreading the word! YAMM helps us in a big way in ti. YAMM makes sending and tracking emails very easy; it's a perfect tool for the type of newsletter my company sends out. 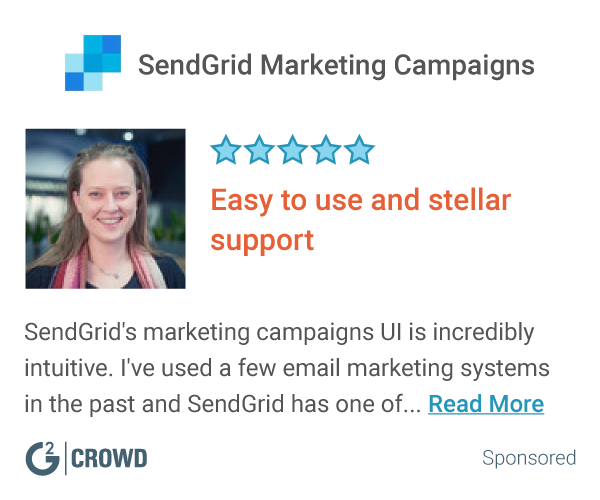 One of my favorite features is a page that shows the data from all of our email campaigns, which makes it easy to compare numbers and get a quick overall look at the click-through rate of sent emails. I wish there was a way to add more than one email to a paid YAMM account. Because that's not an option, I have to share my login credentials with coworkers who sometimes need to access our YAMM email campaigns or track the data. Try it out for free but the paid version lets you send out emails to a lot more recipients. Being able to track who opens and clicks our emails has given my company an opportunity to find potential collaborators and see what organizations are interested in our content. "Don't Use This Product - It populates the wrong FIRST NAME to all my outbound email recipients"
I had to stop using this product...There is no response from support. It worked the first few times and then it would send all emails to, Hello Dhiraj, despite my spreadsheet having a pre-populated FIRST NAME column. It was so embarrassing. So, I blew away my underlying Google sheet and I thought starting from scratch would reset everything...I created a new email list to 3 of my alternate email addresses to run a test....the FIRST NAME column was populated in each row. Once again, all emails were sent out to a different first name that wasn't even on my list. I reached out several times to YAMM support. It's been 6 weeks, no response whatsoever. My conclusion is to always buy quality and with a vendor where you can get support. Do not use this product. Invest in a quality tool. "I LOVE YAMM! Everyone should use it"
It's so simple. to use. Also, if you're concerned about email deliverability, YAMM is great b/c it goes through your Gmail account which has very high delivery rates - unless you're a spammer. I wish it had better CRM integration but I guess you can't have it all. Easy way to send a mass email to a large group of people. I realize there are tools like mailichimp for that but if you're looking for a quick and dirty way of doing this, than this is the way . Also, if you want the "sent" email in your gmail account instead of another tool , like mailchimp, than YAMM is perfect. "Convenient and Efficient mailing tool"
The options it has is great for sending out emails. I also love how it shows how many emails were successfully sent, which bounced back, how many were opened, how many responded. Such a helpul tool! The daily limit can be frustrating, but you do have the option to send more emails if you purchase them. Download it, it will change your life! Saving time, efficient and prevents typing errors. We specifically use it to send candidate interview emails and follow-up emails as well. "This one is the best!" I simply love everything about YAMM. This one's the best. YAMM is much more cost efficient than most of its competitors. I'm currently using the free version of YAMM still I'm completely satisfied with the features. I'm perfectly satisfied with their features. It'll be great if a spam filter is also there to check soft & hard bounce. This doesn't have a spam checker and bounce mail detector. All other features are simply awesome. I like best that it is simple to learn. Seems complicated but is actually super easy. I like how intuitive it is to pull the information from my google sheet and input it into each individual email and personalize it. It completely amazed by what it does. Since I send hundreds of similar emails per day, I found this helpful. I don’t like how the free version limits you to only 50 emails sent. It was scary when I was watching the you tube videos on how to use but once I got in it and sent it was a godsend. Stop sending individual emails when mail merging is available. Complete waste of time otherwise. Performance metrics improved because I am able to send the same email, while still personalizing it, to multiple people in a short amount of time. YAMM makes it so fast to send personalized messages to large lists of people without having to use the BCC function. There is nothing I don't like about using YAMM. Use it! Even if you're emailing a list of 5 people, YAMM is worth your time instead of having to write 5 separate emails. It's so quick! YAMM let's each employee control their own messaging to their lists of clients, rather than forcing everyone to use the same messaging from a central email blast. "The most user-friendly tool for mail merging "
The directions are simple and I love that everything is located in G-suite so that I and my colleagues all have access to the merges and the built-in tracking report. I often run in to the issue of having a limited number of emails you can send in a day without purchasing. I eventually purchased the software, but wish there was a one-time or monthly purchasing option rather than only a one-year option. More affordable options/options for schools as a whole. Our office uses YAMM to communicate with students on a weekly basis regarding advising updates, registration dates, appointment times, etc. We have found that students respond better/quicker/more often to emails that are personalized to them (with name and personal information.) It is a great way for us to send out appointment confirmation emails. The ease of the software; all you need is a google sheet to get started. Sending follow-ups is tricky since you stayed in the same google sheet or if you created a new sheet you could quickly end up with many tabs of follow-ups for the same campaign. I would recommend YAMM to anyone who is looking to start a mail merge campaign. It is very intuitive and an inexpensive way to start implementing email campaigns. It is great for starting a mail campaign, especially since you have a certain number of emails you can send each day for free. "YAMM is a life saver!" I enjoy the easy to use platform. Very simple and ties to google sheets for easy adaptation. The formatting potential could be enhanced. If you need any easy to use mass mail platform. Reaching as many agents as possible with customized e-mails. It automates the outbound process. The ability to plug in 2-300 contacts at once and have them receive emails without me having to go in and type out each manually saves HOURS each week. It is also very intuitive in removing contacts that either respond or bounce back. Unlike their competitor, Yesware, you aren't able to receive notifications when a message has been opened. This is for those conducting HEAVY outbound volume. If you are sending less than 1000 emails a week than consider something else. "Easy to learn, effective tool"
I highly recommend this product, it allows you to customize your emails as you like and still distribute them with tracking. "Easy to use and accurate"
I love YAMM because I can use the information that's already in my spreadsheets without having to create extra documents to keep track of. It shows real time results of what my email recipients are doing and that's very valuable in my line of work. There has been times when a recipient will receive 5 to 10 of the same emails back to back, but with the support team I was able to fix the issue. I have been able to see what emails are valid, which ones bounce back and I can see who's clicked our links. I can send lots of personalized e-mails in a matter of minutes! Allow tracking multiple times on the same sheet. A new sheet must be created everytime you want to use it otherwise the tracking information does not work or e-mails won't send. "Simple but Powerful Email Marketing Tool"
It's so simple. Work directly from Google Sheet and Gmail. There is no need to upload contacts to another website. I highly recommend to everyone who still a newbie in email marketing. The ability to send out mass emails at once and have the emails customized to each individual person. Having to manually upload each persons email, name, etc. Being able to send out large quanities of marketing emails to people at once without sending them individually. "easy merge in google sheets"
"Super fast. Simplifies personal emails. " The interface in the spreadsheet portion of things can feel a little clunky. I can get a lot higher open rates on my emails since they appear to be personal and not a mass email. Love how user friendly it is and that it allows for emails to be used. There isn't much to dislike. I really enjoy this software. Super useful product that makes marketing a breeze. Helps with blast emails, marketing needs, pitches, and updates. Everything worked well and efficiently..
Learning about Yet Another Mail Merge (YAMM)? * We monitor all Yet Another Mail Merge (YAMM) reviews to prevent fraudulent reviews and keep review quality high. We do not post reviews by company employees or direct competitors. Validated reviews require the user to submit a screenshot of the product containing their user ID, in order to verify a user is an actual user of the product. Hi there! Are you looking to implement a solution like YAMM?